Since the beginning of the twentieth century, thirty years have been added to the normal human life expectancy. 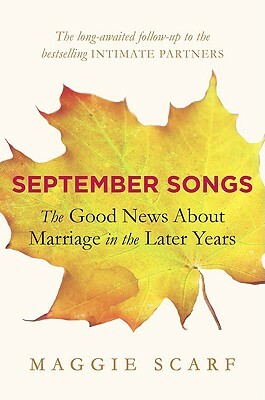 In "September Songs," the follow-up to her bestselling "Intimate Partners," Maggie Scarf investigates the surprising and profound evolution marriage has undergone in these ?bonus years.? In a series of intimate and provocative interviews, she delves into the lives of couples married for more than two decades and uncovers the welcome news that most couples are more satisfied in their marriages today than in their early years together. By giving voice to both their struggles and their triumphs, these husbands and wives reveal how they?ve balanced their emotional and physical needs with those of their partner?s, and how the lessons they?ve learned over time have helped them find new opportunities to love, cherish, and live alongside each other in the extra years they have together. Maggie Scarf is a journalist and the author of the bestselling "Intimate Partners," among other books. A visiting fellow at the Whitney Humanities Center, Yale University, and a fellow of Jonathan Edwards College, Yale University, she is also a contributing editor for "The New Republic." Scarf and her husband live in Connecticut.